The new Wembley opened in 2007 and had a capacity of 90,000. The stadium has 2,618 toilets, more than any venue in the world. The club has hosted Tottenham Hotspur games in the Champions League and for season 2017/18 will be their home while White Hart Lane is rebuilt. The first official game at the new stadium came on 24th March 2007 as England U21 and Italy U21 shared a 3-3 draw. Giampolo Pazzini became the first player to score at the ground, netting after just 28 seconds. The first final, competitive game and club game was the 2007 FA Trophy Final where Stevenage Borough defeated Kidderminster Harriers 3-2. 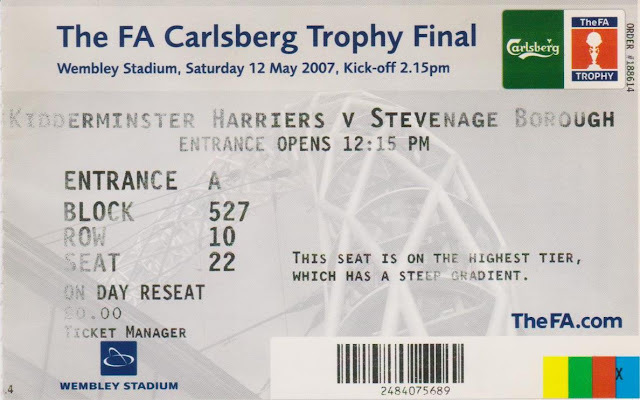 My first visit to the new Wembley Stadium was for the first ever FA Trophy Final played there between Kidderminster Harriers and Stevenage Borough. I'd wanted to go to the new Wembley Stadium as soon as possible and so when tickets came up for the FA Trophy Final for the great price of £15, it was too good an offer to refuse. I went on the train, meeting my friends Paul & Sue there. We had great seats on the halfway line and we were part of a crowd of 53,262 as the pocket-friendly prices and novelty of it being one of the first games at the new Wembley drew a decent attendance. The game was refereed by future Premiership referee Chris Foy and the match passed off without much controversy. There were notable players for both sides - former Wycombe keeper (albeit on loan from Southampton) Scott Bevan played for Kidderminster whilst Stevenage also had former Chairboys John Nutter, Luke Oliver and Steve Guppy. Kidderminster roared into a 2-0 half time lead thanks to a brace from James Constable. However, Stevenage roared back in the second period and Mitchell Cole, Craig Dobson and Steve Morison scored the goals to complete a dramatic turnaround. 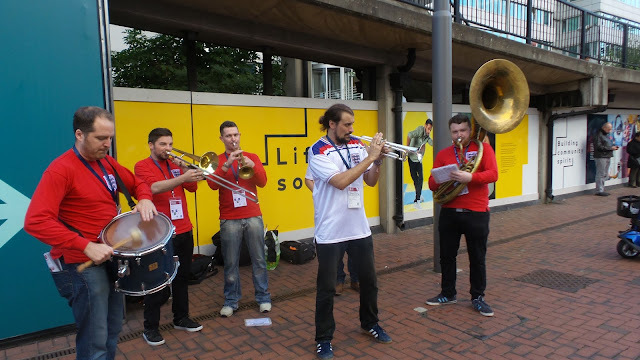 I returned to Wembley the next October for an England game against Russia as I'd not seen my national side live since the days of Terry Venables. The pressure on manager Steve McClaren was reduced following a decent performance against Israel the previous Saturday, which we won 3-0. But Russia were expected to be tougher opposition and I thought that we would do well to get a win of any sorts against the side managed by Dutchman Guus Hiddink. I drove to Amersham Station and got the train to Wembley from there. Far easier than parking around the stadium and paying silly prices. It cost me just shy of £6 for parking and train fare and with the ticket only costing me £32.50 it was an affordable way to watch my national side. Getting the train out was no problem and I arrived in Wembley at around 6. A decent pre match atmosphere was already building up as I had a mooch round the local area. I stocked up on goodies for the game and got some dinner. Curry Sauce and Chips was very nice and at £2 was way cheaper than the overpriced fare inside the stadium. I doubt you find a better Curry Sauce and Chips down South, you'd have to go up North to find the real decent chippies. 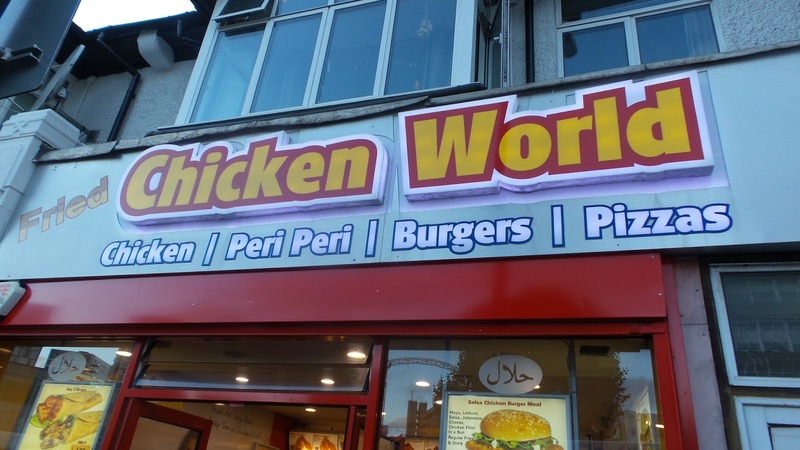 The outstanding one is the Mill Lane Chippy in Macclesfield, honorable mentions also to the one outside Rochdale's away end. I got into the stadium at about 7.20 and it was nice and easy to find my seat. 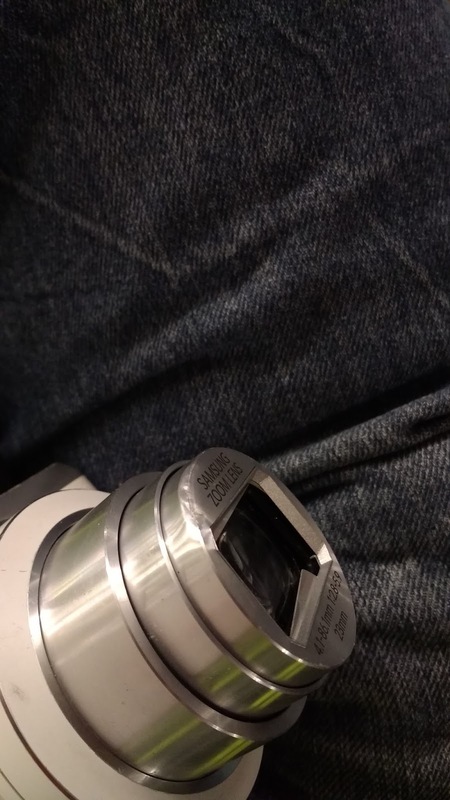 I had a great view, right up in the corner as you can see from my picture. The atmosphere was good too, England fans made themselves heard and the team reciprocated with a very good solid performance. Although it was disappointing to hear the booing of the Russian national anthem - pointless and disrespectful in my opinion. There will be acres and acres of match reports elsewhere so I won't go into too much detail. England took a 2-0 lead in at half time, both goals from Michael Owen. The second one was particularly good, a dipping shot beating the Russia keeper. In that first half, Russia were playing fairly well until 2-0 - they even had a goal chalked off for offside when it was still 1-0. Russia started the second half the strongest and had a few good chances within the first 10 minutes. But eventually, England took control, putting the game beyond doubt with a rare Rio Ferdinand goal. England could have had more but stout Russia defending prevented them adding to their tally. A good performance and a good game then. 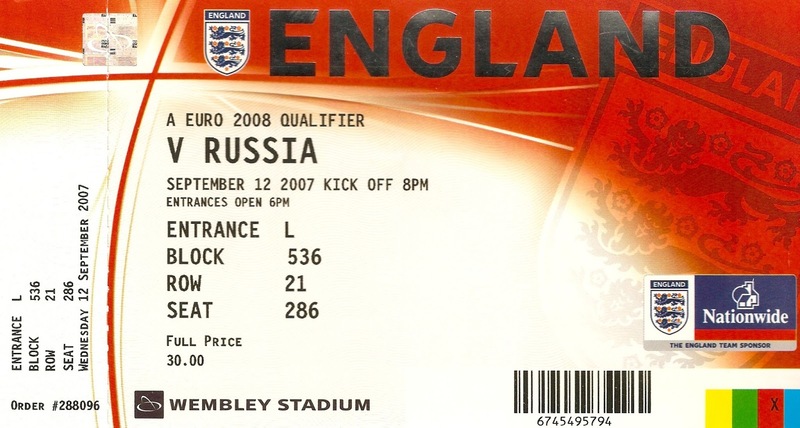 Sadly England failed to Qualify for Euro 2008, following a rain soaked 3-2 defeat to Croatia in the final game. 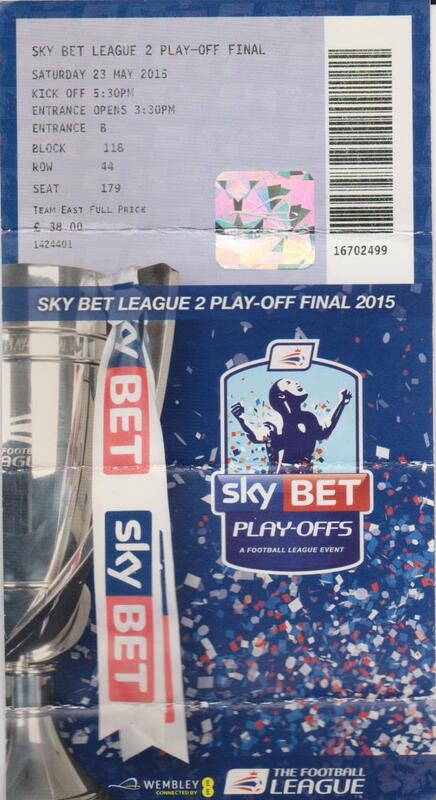 I had to wait another 7 years to visit Wembley again, with me seeing two playoff finals in a week. 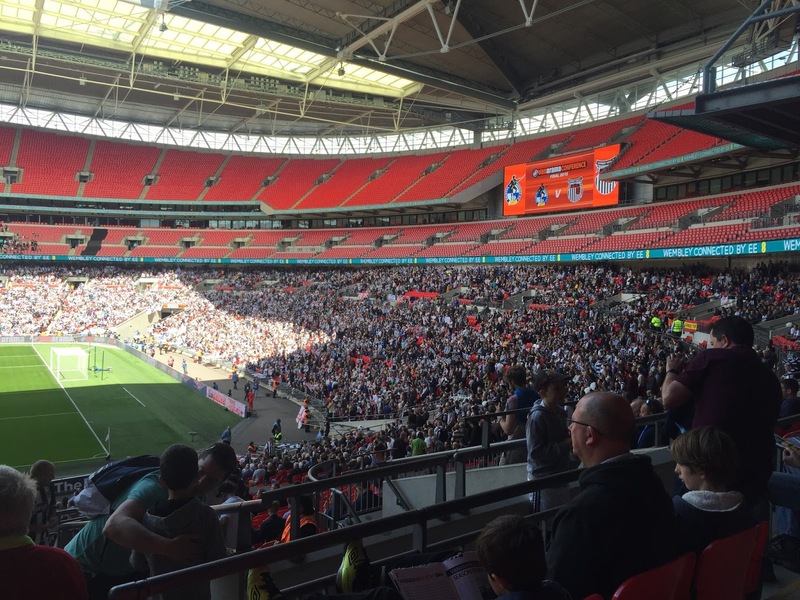 First up was the Conference showpiece between Bristol Rovers and Grimsby Town. I'd bought tickets well in advance for this one, thanks to the Vanarama Big Day Out offer for a bargain £10. It did involve buying a voucher from Forest Green Rovers and then posting it back to them to exchange it for a proper match ticket. It was a bit of a faff, but they were the only club that would do it via post. 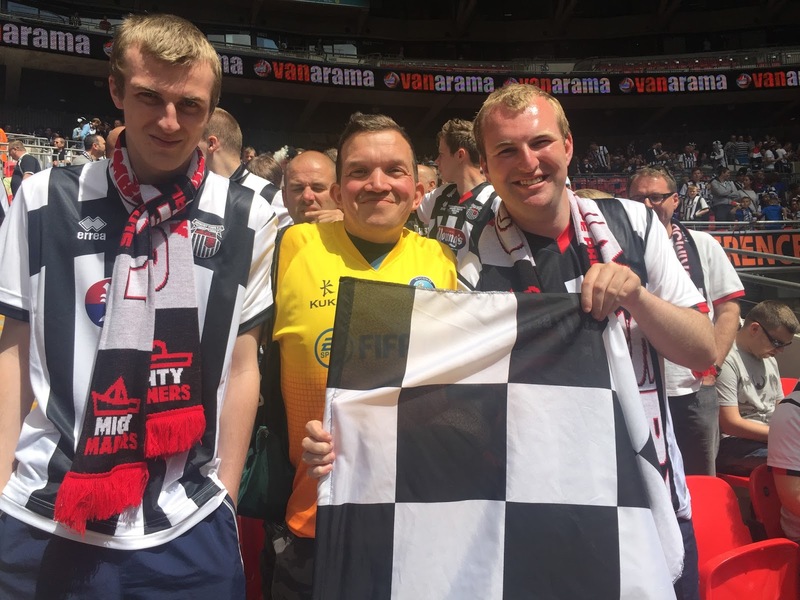 I was delighted when Grimsby Town was one of the finalists as I knew a load of fans from their club at the time. As it was, I had to work late and I missed out on meeting some mates, although I did meet a few people, getting some pictures and catching up. Sadly for my mates, Bristol Rovers prevailed in a tense penalty shoot-out with former Wycombe man Jon-Paul Pittman missing the decisive kick. 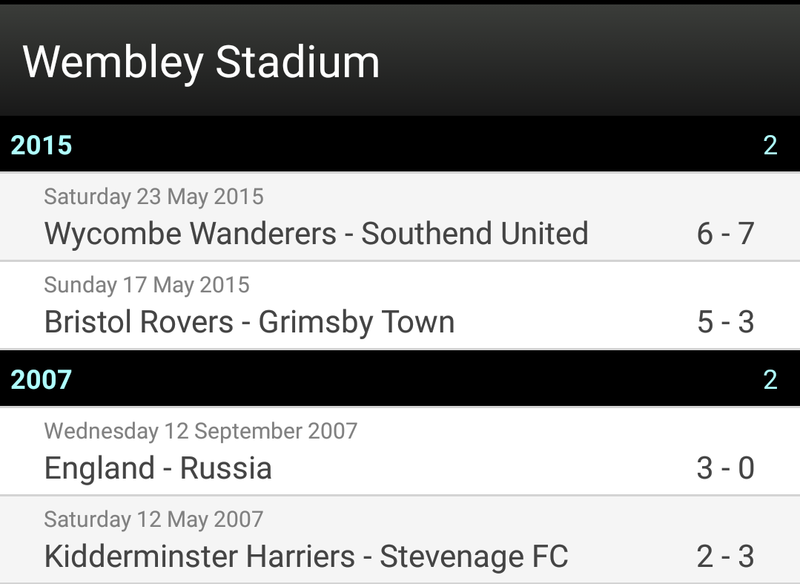 Grimsby would go up the following year, but it was a shame not to have them up sooner. 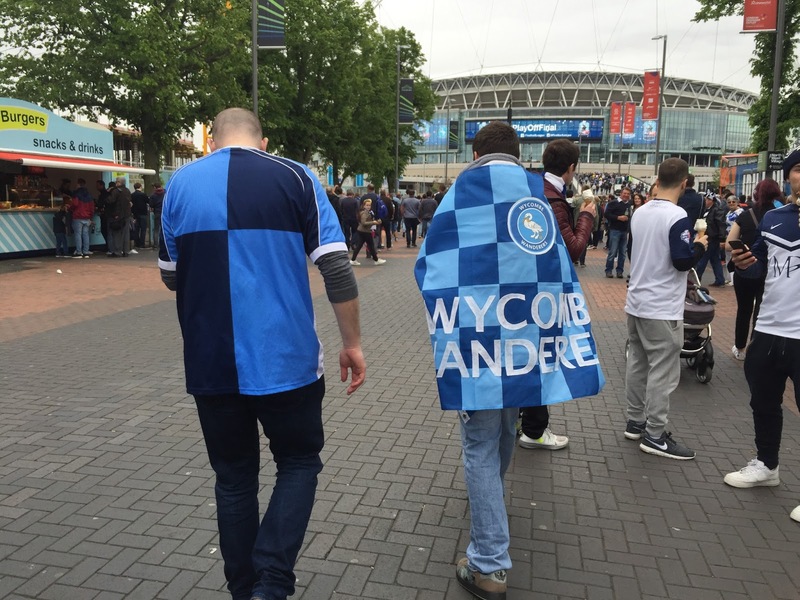 It was the same story for my own team, just 6 days later.Wycombe had got to the final thanks to a two-legged playoff final win over Plymouth Argyle. Tickets were a lot more expensive for this one with me paying £43 for what was a pretty poor seat, once TicketMaster's extremely greedy fees of £7 had been added. There was also a great expense for me on the train - £23 as I wanted to go from Wycombe and have a drink in London, though I did at least try a few new ciders. The game itself was a ponderous 1-1 draw with Wycombe being denied victory 20 seconds from the end of extra time by Southend. Many of their fans had already left the ground and were refused re-entry for the penalties. They had the last laugh though, as their side won in the shootout as Wycombe were denied in the cruelest of fashions. After the last two games I saw at Wembley being so disappointing, I was feeling fed up with the place and was in no rush to return. However, for some reason, I had not updated my blog and really wanted to do the stadium justice. 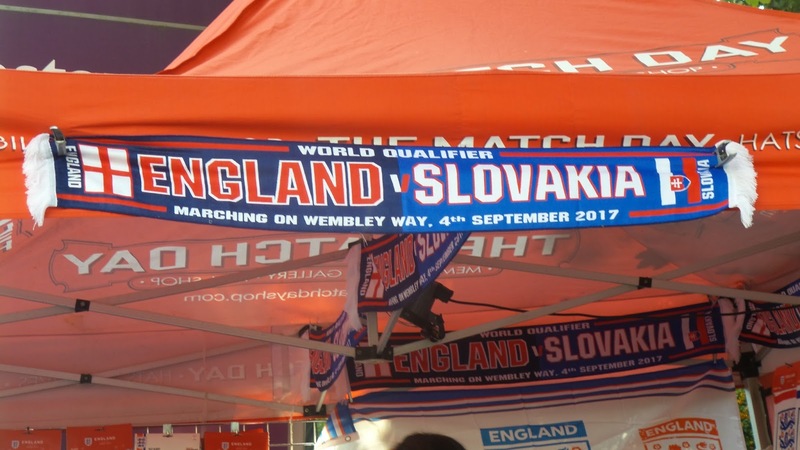 The ideal opportunity came with the England v Slovakia World Cup Qualifier, though I wasn't originally considering it, due to not wanting to pay the £35 entry fee. But then a deal came up on the Hot UK Deals site. tickets for a tenner if you entered a code. It appeared to originate from the NUS but didn't explicitly state it was for students and they sold me a ticket in my name, despite having my correct age details on their database, so I could only assume it was legit. It would be the first day of my fortnight's holiday, my first week off work for 6 months and watching England would be the ideal start to my holiday. Though I'm no England fanatic, having been let down by them too many times, I do watch every game on TV and welcomed the chance to see them live. On the Friday before, England laboured to a 4-0 victory over Malta, with three of the goals coming in the last 10 minutes. On that showing, my ticket price of £11.50 was about right and despite lots of attractive alternative games coming up, I was still looking forward to my revisit to Wembley. On the day of the game, I was annoyed to wake at my usual getting up for work time of around 5 am. After trying to get back to sleep and failing, I gave up and got up. After some eggy bread for breakfast and watching Youtube videos I had a bath before walking down town. I picked up a few bits I needed before walking home, though all the good that the 8-mile walk did was offset by buying and eating junk food. The night before, I'd picked out 28 possible matches for my Wednesday game, which were whittled down to 12 before I left for town. After getting back and having some lunch, I reduced the choice to 4. I listened to the Jon Holmes show on TalkRADIO while I further researched my options and also started getting my stuff together for tomorrow's trip to Liversedge, where I'd be staying overnight. I left home at 4.30, getting to Amersham station 25 minutes later. I had to wait 20 minutes as per usual at Amersham for the right train, but soon enough I was on my way. I got to the ground just before 6 and despite the big game, there were still plenty of great deals. I had a double Piri Piri burger meal for a fiver, plus a couple of cans for £1.50 and £2.50, so it's still advisable to shop around. I got into the ground half an hour before kick off. The tannoy was blasting out tunes from past glories such as Italia 90 and Euro 96 which really got me in the mood for the game. It was a frustrating start to the game. Slovakia took the lead after a few minutes and later on, I dropped my camera rendering all the pictures taken from then on as blurry. At least England got their act together, later on, turning the game around to lead before the hour, Marcus Rashford being England's main inspiration. The Three Lions did hold on to win 2-1 without much drama, the match report is above. After the game was the usual bun fight for space on the train, but it was managed pretty well by the Police and I was on the train shortly after 10. Due to the lack of trains to Amersham, I had to change at Harrow On The Hill with a 12-minute wait for my final train. I got back to Amersham at 11 and home 15 minutes later. When I got home, I decided my Wednesday game, going with my heart and choosing Stokesley Sports Club, as they had been so helpful in the past. A couple of drinks were consumed, but it was a quiet night, even though I didn't get to until 1 am. WEMBLEY STADIUM is a bit of a mixed bag. If you are sitting low down in a half empty stadium, then it's a horrible place to watch football and is also pretty unattractive during the day. 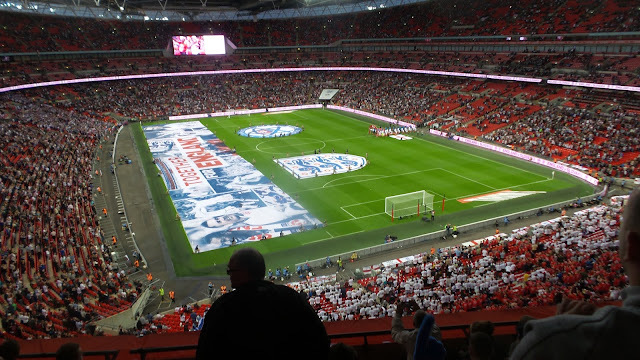 However, get a ticket high up, as I did for the England games and with a full stadium under the lights, it's a great experience with excellent views and legroom. There's a club shop at the ground, but I've never visited here. Parking wise, expect to pay crazy money, so it's far better to come on the train. Stations in the immediate vicinity of the Stadium include Wembley Park (Metropolitan and Jubilee underground) and Wembley Stadium (national rail)Food options inside the stadium are crazily expensive, so probably the best food options are along Bridge Road where there are a number of outlets including an excellent Chinese chippy. There are also a number of corner shops that sell chilled cans of beer and cider for around £1.50 a pop and this is a decent option as the Police are pretty relaxed about street drinking as long as you behave. There's also a Lidl and Asda in close vicinity, though I'm not sure how these are with opening times and serving booze, There are plenty of pubs around, but these hike up their match day prices, are of varying quality and are often full. However, these do tend to have a bit of good atmosphere going in them.